Devi Chinnamasta - She help us to liberate ourself from the desire for sensory input, cutting off the source of the movements of mind and reaching deep meditation (samadhi). Maha Kali - Worship signify and related to die daily, detach from body consciousness and the impermanence of all things, transforming into the eternal unborn being. Maa tara - She help us to move accross the pond of mind & emotion, guided by the savior star that is silence, the void, nada, the primordial sound. Maa Matangi - Teach us to speak truth, teach truth, sing of truth, paint truth, even if it makes us outcasts, even if we feel unsuited, and thus invoke its purifying power. Goddess Bhuvneshwari - She let the fullness of inner space merge with the cosmic womb of outer space, with the divine mother, and join the play of loving union with everything. Goddess Kamla - She help us to share wealth, beauty and enjoyment in order to obey the magic law of karma, thus providing a peaceful background for spiritual growth. Devi Baglamukhi - She apply the stunning power of the truth of complementarity upon all negativity, silencing confusion and doubt. Maa Tripur Bharavi - She let the awesome power of truth destroy all impediments to spiritual growth by burning them in the fire of tapas (ascetism). Maa Tripur Sundari - She help us move beyond the perception of form into the delightful union of seen and seer, the divine beauty in everything. Shree Yantra, forms the centre and Das Mahavidyas around it making it the most auspicious. It forms the 10 incarnations of Maa Shakti, procreater of Universe. 1. It protects you from Evil Spirits. 2. Blessing of Maa Durga (Shakti). 3. It improves your confidence. 4. It protects you from all Tantrik Spells. 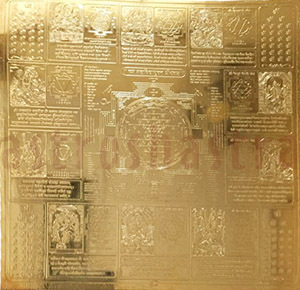 Astroshastra as an effort to provide our customers the best has made Das Mahavidya Yantra to remove all obstacles and bestow you with wealth and prosperity in three sizes. You can place it in your Puja Ghar. A person who regularly woship this yantra gets sure progress in life and new doors to success automatically open for him. size: 8" X 8 "